Protesters and police clashed Saturday during demonstrations against police brutality in the Mike Brown and Eric Garner cases. Several members of the press were assaulted by police officers wielding batons. Photo courtesy NBC news/2014. 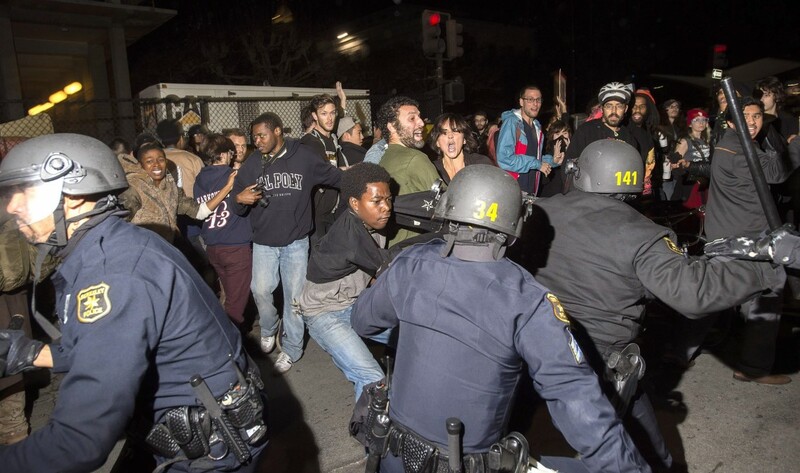 The Northern California chapter of the Society of Professional Journalists condemns, in the strongest terms possible, the outrageous conduct of law enforcement officers who assaulted members of the media during last night’s (Saturday, Dec. 6, 2014) demonstrations in Berkeley, California. You have an obligation to ensure that all officers, including those providing mutual aid, respect the constitutional rights of the press. SPJ has been in touch with a number of working journalists who say they were struck with police batons while working and clearly displaying press credentials. In one incident, a journalist who was on assignment tells SPJ that he was holding out press credentials and telling an officer he was a news photographer when struck. This same journalist also reported seeing a colleague take “serious blows” from police who “hit him with impunity,” despite the fact that the colleague was “obviously press.” Other reporters also described witnessing or experiencing similar assaults. We are sure that you agree attacks on journalists are entirely unacceptable. Reporters are on scene to report the news as it happens. They are not participants in the protests. Under no circumstances should members of the press be subject to such gratuitous and potentially deadly police violence. Word is being spread of plans for another protest to begin in Berkeley at 5 p.m. today, Sunday Dec. 7, 2014. We implore you to ensure that all law enforcement officials working tonight’s protest, including those providing mutual aid, adhere to their constitutional obligations and respect the freedom of the press. We also call for a thorough investigation into inappropriate uses of force by officers against members of the news media. See, e.g., Young v. County of Los Angeles, 655 F.3d 1156, 1162 (9th Cir. 2011) [“Furthermore, Los Angeles County Sheriff’s Department policies instruct officers that ‘[h]ead strikes with an impact weapon are prohibited unless circumstances justify the use of deadly force’]; cf. Thompson v. City of Chicago, 472 F.3d 444, 451 & nn. 18-19 (7th Cir. 2006) [describing Chicago Police Department policies limiting the use of “impact weapons” such as batons to “high-level, high-risk assailants” who “pose[ ] a threat of serious bodily injury or death to officers and the public”]. See McLaughlin v. City of Los Angeles, No. B217198, (July 27, 2010).